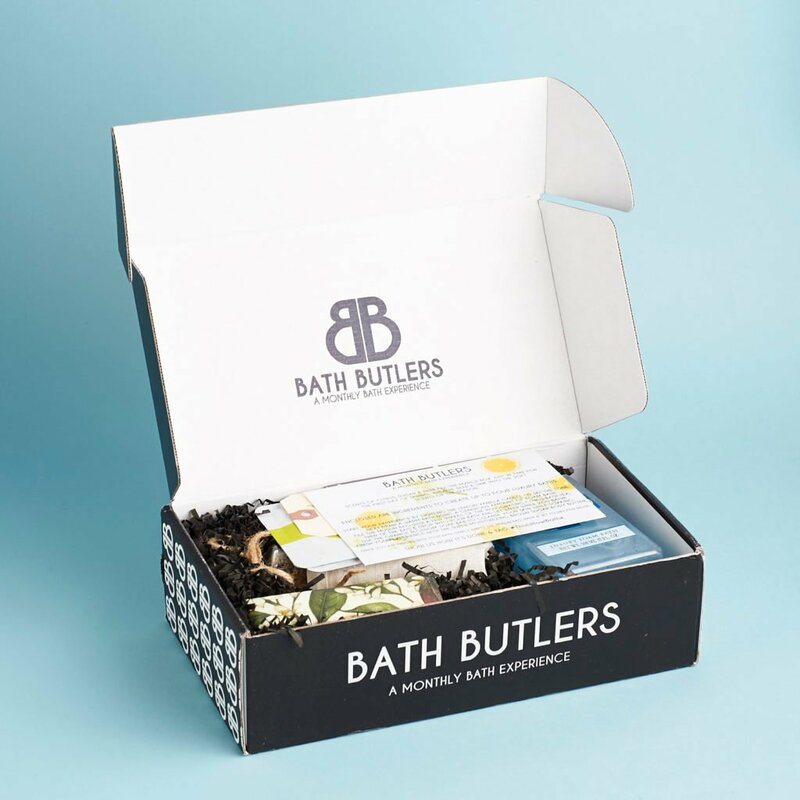 Bath Butlers is a monthly luxury bath subscription box. Each box contains enough items to see you through four dreamy bath experiences. The people behind the box seek to celebrate “me” time with at least 5 spa-inspired products each month. 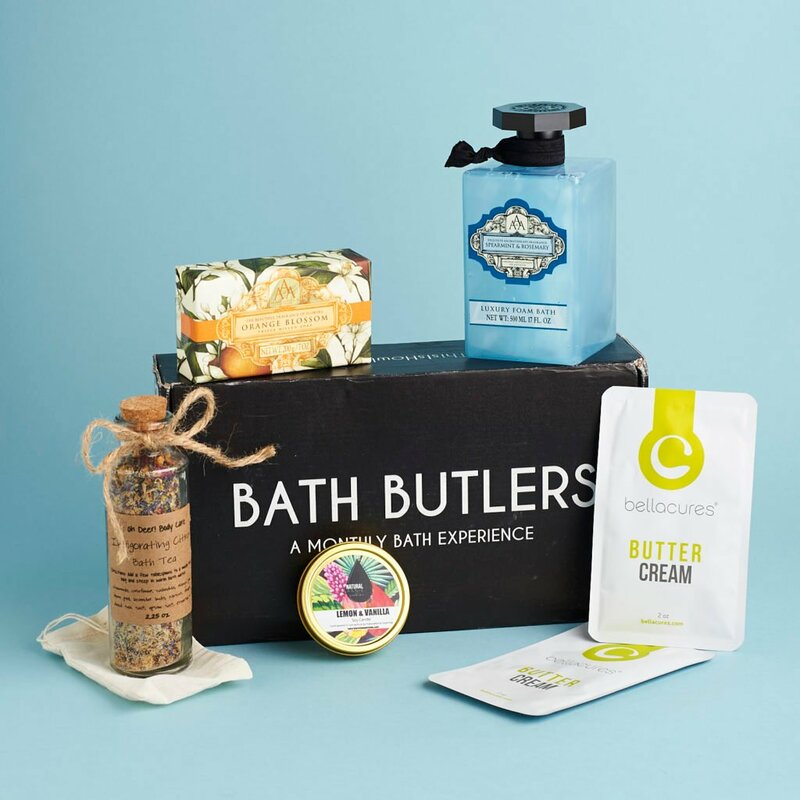 Check out all of our Bath Butlers reviews and the Beauty Subscription Box Directory! This month’s box focuses on refreshing scents of citrus, sugar, and herbs. I think it’s cool that there’s an explanation of how to use all of the products in the box to create a great bath experience. All of the items in the box are listed out on the opposite side of the card. This body butter says it has a vanilla brown sugar scent—I picked up on the vanilla a bit, but the fragrance is way more fresh and clean than the sumptuous bakery scent I expected. The butter is a light pistachio kind of color and has a looser consistency, unlike the thicker, literally buttery body butters I’ve tried in the past. It did a nice job moisturizing my just-out-of-the-bath skin, soaking in easily and leaving a smooth, soft finish. One packet was enough for me to lightly moisturize my legs, arms, and torso, so I’m glad there was a second packet that I could use to give drier spots (like my knees, feet, and elbows) some extra love. There’s an info card about Bellacures, too. They’re based in Texas, so I probably won’t be able to stop by and meet them in person. I like the idea of a spa all about hands and feet, though. It sounds so luxurious! This little candle is a great size for my small bathroom. It sits comfortably on the edge of my tub, on my windowsill, or even in the corner of my sink. The scent is just a bit sweet and refreshingly lemony. I found it to be a great sunny-Saturday-afternoon-bath kind of fragrance, rather than a unwinding-late-on-Friday-night-bath aroma. I really loved the experience of this bath “tea”, which is essentially everything I like about bath salts amped up with the natural beauty of flowers and herbs. The experience made me feel like I was some kind of magical fairy queen! The tea itself is really beautifully citrusy. It’s kind of a warm, sweet citrus scent, rather than crisp, which makes it great for bath time. It sort of eases you awake rather than snapping you to attention the way some citrus does. The key is the other flowers in the salts, which add a softness and a prettiness to the scent. The tea comes in a reusable muslin bag to scoop tea into and toss into the bath. I ended up doing a mix of steeping this “tea bag” in the water and sprinkling the mixture loosely in the tub. Super dreamy. There’s a coupon on the back of the tag that came on the bottle, too! I always forget how much I love orange fragrances. Like the other scents in this box, the orange of this soap is tempered with floral notes, so that the scent is both refreshing and elegant. It’s a really lovely, soft bar of soap that creates a nice lather. It’s not as creamy a lather as I might have liked, but it’s a nice bar of soap nonetheless. Spearmint and Rosemary Luxury Foam Bath, 17 fl. oz. – Value $14.99? This was one of my favorite scents in this month’s box. The mixture of spearmint and rosemary was much more herbal and gentle than I thought it might be. When I see “mint” of any kind (especially when it’s featured in an icy blue formula), I assume the scent will be sharp and immediately awakening. This scent was rejuvenating but in a gentle, refreshing way. It came with a little hair tie, too! My hair is shorter than short right now, but I appreciate that they have longer-haired people covered! Verdict: This box was perfectly springy and rejuvenating. All of the scents were super sunny, and I really liked experiencing the out-of-the-ordinary bath tea! By my estimates, the value of this box is about $40.00, which is nicely above the $29.00 price. My shipping cost was about $5.00, meaning this box in total was about $34.00. It’s tough because I did really enjoy these products, but $34.00 is a lot for me to spend just on bath items each month. I also feel a bit like the luxury bath and the orange bar soap are items that I could find pretty easily at local home discount stores, so they didn’t feel quite as “special” as the other items. What do you think of this month’s Bath Butlers? How do subscribers rate Bath Butlers? Do you subscribe to Bath Butlers? Add your rating now! Thank u for the honest review! I wish some of these awesome bath boxes were quarterly versus monthly. I have a beautiful big tub, but it takes me awhile to go through bath products, when even in winter I maybe take baths 1-2x a week and probably only 1-2x a month in the warmer months. I also hardly ever use bar soap so that would be a waste on me. Does anyone know of quarterly bath subs? Or even bi-monthly? Most sub boxes allow you to skip a month & Bath Butlers offers this! 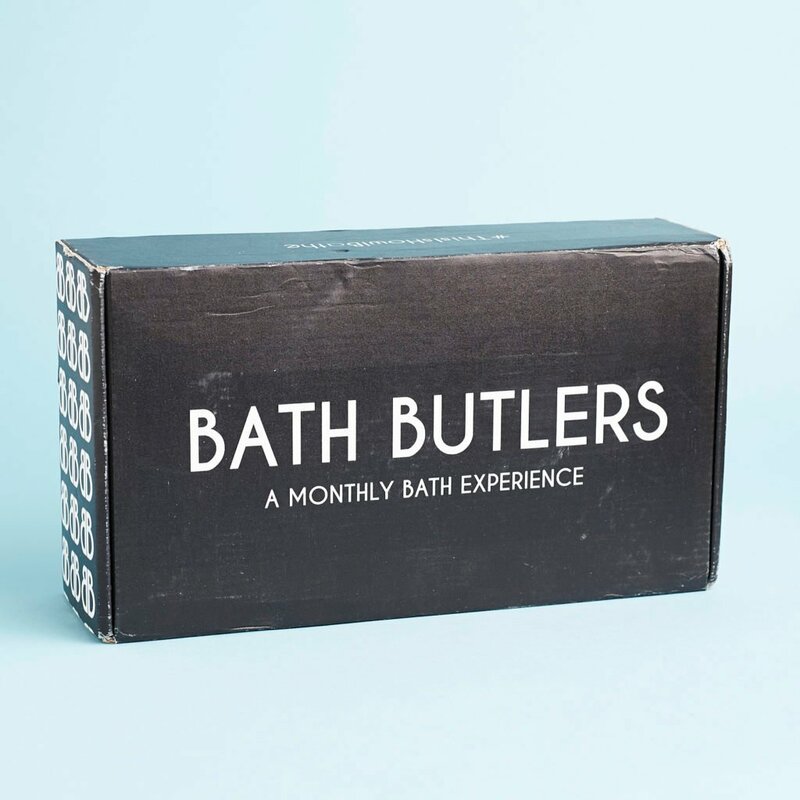 For example, if you signed up for month to month for Bath Butlers you will be charged immediately for your first box, then go into your account and choose “skip next shipment”. You do have to keep up with it but if it’s not too much trouble it would be worth it. You could also email the sub and ask them to keep up with it for you…they might be able to help! All subscriptions on cratejoy have a function “skip the month box”. There are several bath subscriptions. I hope it helps.